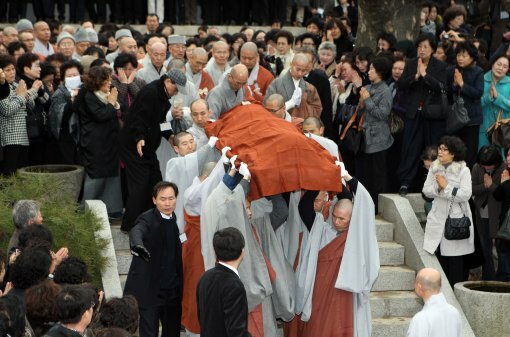 Venerable Beobjeong, a major leader of Korean Buddhism, passed away yesterday at age 78. Ven. 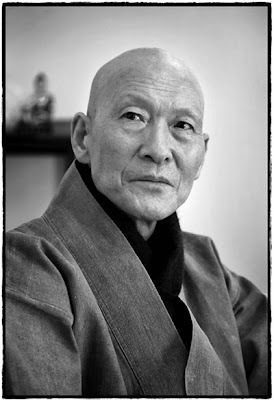 Beobjeong was not only a man of the highest spirituality and integrity, but also was quite a writer who sought to make the Buddhist way accessible to as many people as possible. He also had a great relationship with the leaders of Korean Catholicism, always striving for religious harmony in Korea. - We possess things because of need, but sometimes we spend our heart because those things. Therefore, to possess something is to be held into something else. Thus, possessing much means being held as much. - Flowers; do not take for granted this heart-filling truth that blooms around us. This is an amazing mystery. We must reflect upon human history through the flower's bloom. How much am I blooming the clearest and most beautiful element within myself? We must reflect our own lives through flowers. - The empty heart is called musim. The empty heart is our true heart. If the heart is filled with something, that is not the true heart. Without emptiness, there is no resonance. Without resonance, life cannot be fresh or energetic. - Musoyu ("not possessing") does not mean not having anything; rather, it means not having anything unnecessary. The clear poverty that we have chosen is much more valuable and precious than wealth. - Who am I? Ask yourselves that question. You must ask, ask and ask again until your inner face emerges and shows itself. Do not ask cursorily, but ask desperately with the voice within your voice, against the ear within your ear. The answer lies within that question. -There are two ways in Buddhist training. The way of wisdom, through which the self is formed; and the way of mercy, through which your neighbors are warmly cared for. If either one is missing, it is not Buddhism, nor is it religion. Every religion has these two elements. A religious life entails care for others at the same time. You will absolutely not kill any precious trees for any grand cremation ceremony, and do not waste money on new cloth for new burial clothes. There’s leftover firewood that I already gathered at my mountain hut. Cremate me there by the rocks where I used to meditate. Scatter my ashes on the ground where the azaleas graciously bloomed each spring. That will be my final recompense. Accordingly, as you can see from the picture below, the body of Ven. Beobjeong was not put in a casket, but was simply laid on top of the low table on which he used to sit, and was covered by his overcoat. There is not any need to speak the trite words, "Rest in peace." He had long attained peace while he was alive, and his passing is no more than that -- passing, and continuation of his spiritual life. [謹弔] Passing of a truly great man, who acted in harmony with his teachings. He will be missed. I've looked on the web for English translated copiers of "non possession", but I cant or seemed to find it. Do you know if the book is available and whether it was translated in to English? I have a question about Buddhism. When I was in Korea there was that little box in a museum. My wife told me it contain a gemstone they recover from the aches of a important monk after he is cremated. That stone is displayed every year so that delivers can see it. What is it called. Where does it come from. Any scientific information about those stones? The Gemstones are called: Sarira. Refer to a kind of pearl or crystal-like bead-shaped objects that are purportedly found among the cremated ashes of Buddhist spiritual masters. Sarira are held to emanate or incite 'blessings' and 'grace. The long wait was worth it, I have an answer. So now I can go and digg the interweb, to find more info on those Sarira! Just another question, While visiting the National Museum and other archeologie related museum, I saw a lot of Knife, dagger, small sword made of stone, polished. Again not much information other than that they are knives. Anyway, I was wondering if those knives were used during wars, because a stone knife looks really heavy and really not efficient like silex, or metalic blades. We have in europe, sword that were used for ceremonies, decoration etc. My brother in law said it was really used during war and for fighting. I have a hard time beliving that.